The Cincinnati Museum Center underwent renovations and is reopening. WATCH the documentary, "Saving Union Terminal," free online with no commercials. CINCINNATI - The one constant about Union Terminal - which evolved from a grand railroad station in 1933 to a science center to a shopping mall to a vacant "white elephant" to its current incarnation as the Cincinnati Museum Center - is time. 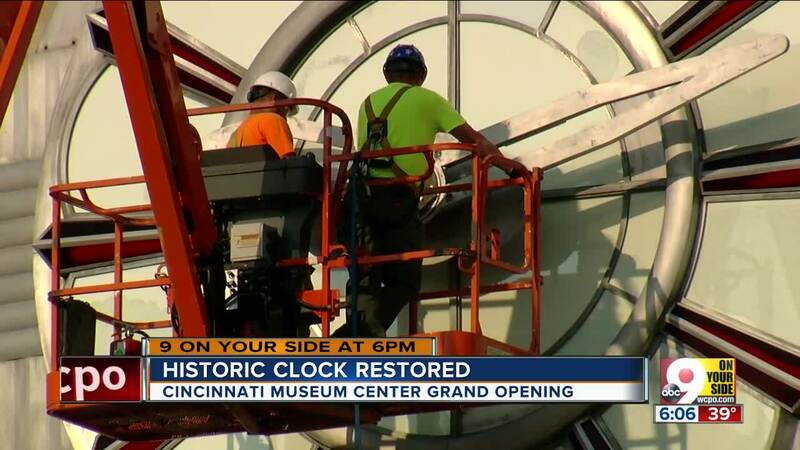 The restoration of one of Cincinnati's most cherished landmarks wouldn't have been complete without overhauling and fine-tuning the familiar neon clock on the facade, which beckoned travelers, shoppers and curiosity seekers from its perch four stories high for the past 85 years. When visitors arrive at terminal following Saturday's reopening, the clock and completely refurbished fountain will catch their eyes as soon as they pull into the long driveway. Perhaps none of the massive building's features was more important than the clock. "Because this was a train station … time was critical," project manager Nick Cates said. But even clocks are subject to the wear of time. When the terminal sat abandoned, the clock went into disrepair. The timer needed recalibrating. The broken neon lights had to be replaced. "We rebalanced the hands. We have new neon ... so it's just completely refreshed," Cates said. "I think it's really just become an icon for the city." Union Terminal partially reopened Nov. 2. Now, visitors will be treated to new Dinosaur Hall and the return of the Duke Energy Holiday Train display. More galleries will open in phases over the next several years. LEARN MORE about the reopening of Union Terminal.